Wine rack. Wall mounting handmade wrought iron with wooden shelf on top. 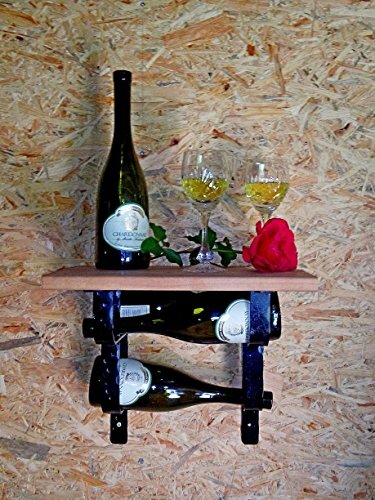 Two handmade wrought iron brackets shaped to hold up to three wine bottles with Siberian Larix wooden shelf on top. Every item is unique since it is entirely handmade. *Extendable to hold up to 6 bottles. **Bottles and glasses are not included. Each bracket is held by 3 screws that are included in the package along with wall anchors for the type of wall you specify when ordering. Cheers!